UFC flyweight champion Henry Cejudo has had to defend the questionable stoppage in his bout with bantamweight champ TJ Dillashaw. That is when he isn’t playing digital footsie with Nikki Bella on social media. The stoppage in question occurred in the main event of the UFC’s ESPN+ debut on January 19th. Cejudo rocked TJ twice and sent him to the canvas on his knees where he unleashed another barrage of punches putting Dillashaw in dizzy land. Despite appearing to be defending himself the referee stepped in at :32 and made TJ a de-legitimized title holder and Cejudo a legend. 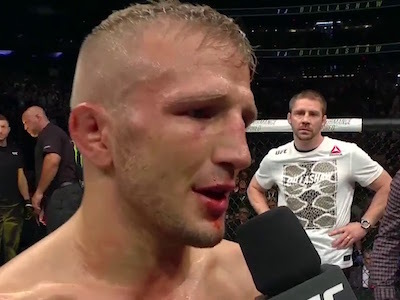 There are many who agree with Dillashaw that it was an early stoppage including a very frustrated Dana White. The latest to give their take is legendary referee “Big” John McCarthy. He is firmly behind the claims of an early stoppage and he discusses it with MMAFighting. Check it out.